Whether you have been shooting for years or never picked up a bow, the Bullseye Archery Game offers a new way to experience archery. 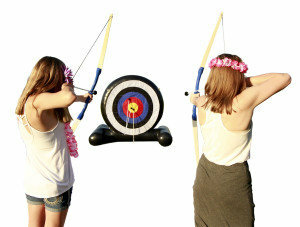 The Archery game features non-lethal arrows. The soft foam tipped arrows offers the same flight characteristics as a standard arrow yet much safer, allowing opportunies to shoot indoors without special netting. At the end of the foam tip arrow is a colored velco disc. When the arrow hits the target, the disc stays on the "hit" area as the arrow falls away. Leaving behind a clearly visable disc that can be over lapped by you or your opponent. Play with one or two players, closest to the bulleye wins.